My husband brought the wood home from the auction years ago. It has been sitting in our own barn waiting to be used for projects or whatever. And it reminds me of the way of our days. The timelessness of keeping things sacred and the limitedness of moments with people. And the fullness of God. I sit here in the mornings, when my schedule permits it… and I see these words as a mantra. I know I placed it there for that reason. Even though it greets my guests as they enter, and it’s a banner over them as they take off and put on their jackets, I purposely hung it where I would see it daily… if not multiple times a day. Because I need grace like I need to breathe air and drink water. Like the woman at the well, longing for a drink of the water that would keep me from thirsting, grace is the nutrient that my soul requires to get through life. 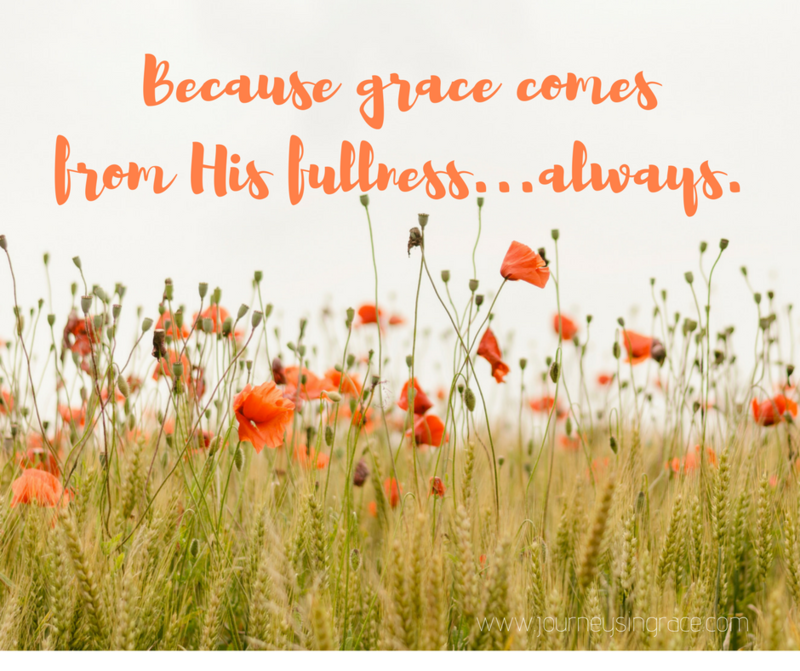 But we all need to know grace…the fullness of God poured over us kind of grace. Because grace is more than a one-word definition. Even throughout scripture the characterization of the Hebrew word, chen, is translated favor but indicative of kindness, while in another form it means supplication of favor, chanan. It can even be considered an ornament to be worn, like a crown. And in the Greek, charis or charisma, is typically translated as grace meaning a gift of fullness or kindness or mercy, of undeserved favor from God, but most definitely it is a fullness that is freely bestowed by God. Grace makes more space for God to show up in our less than favorable moments. Grace is the filling that pours over us when we are emptied and needing to be renewed. Grace equips us for Holy work. Both His and ours. It is a holy set apart sanctifying labor. The kind that rearranges, sets aright, heals and holds us in. Grace is a Holy Labor. The birthing kind of hope conception. The enduring beyond the temporal kind of wonderment. The race-running-faith-finishing-strong kind of discipline that calls us into the secret place where God meets us in mercy and kindness and favor and we come out changed for the ordinary, wrecked for the mundane, ready for His kingdom to set up residence within us. And we need to surrender to the grace work. It perfects us because of His Love…grace originates with God…Always. Our work needs to be tinged, colored and painted by grace… like an artist that layers the sections of a canvas carefully, intentionally, and purposefully pulling out the masterpiece within. Grace adorns us in a way that points to the image of Christ, hidden in the recess of our soul, birthed by the conception of love in our choosing to be chosen by Him, our reception of the whole gift of God in Himself and all He is. 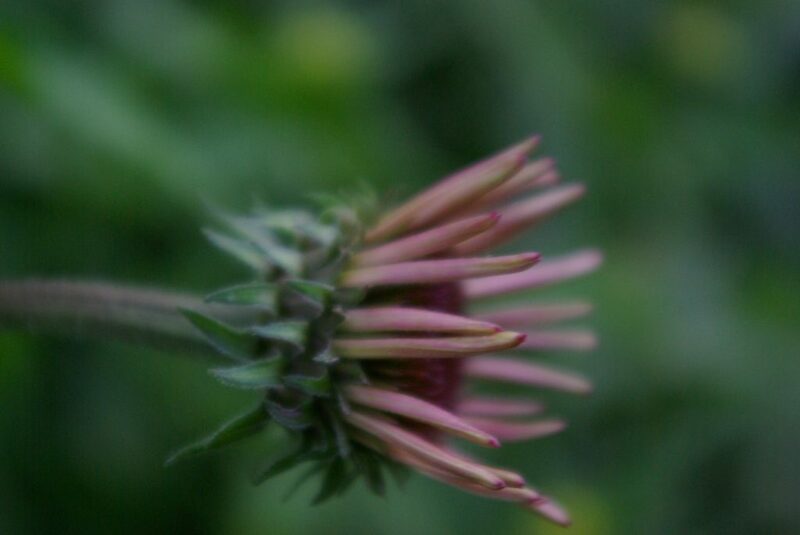 Grace gives the dimension to see the layers, to peek inside the masterpiece with discernment and patience and faith. As patience is a perfecting work, and love is a renewing work, grace comes like a whisper and sparks all kinds of hope eternal, extended kindness, and favor unmeasured. Because it is a symbiosis of purpose…His and ours working together for His glory. Beloved, above all we need to be those who prosper in the goodness of His offered graces. (John 3:3) And as we function in the healthy grace… the wholeness of grace… the fullness of His Grace we are drowned in kindness and mercy and favor. 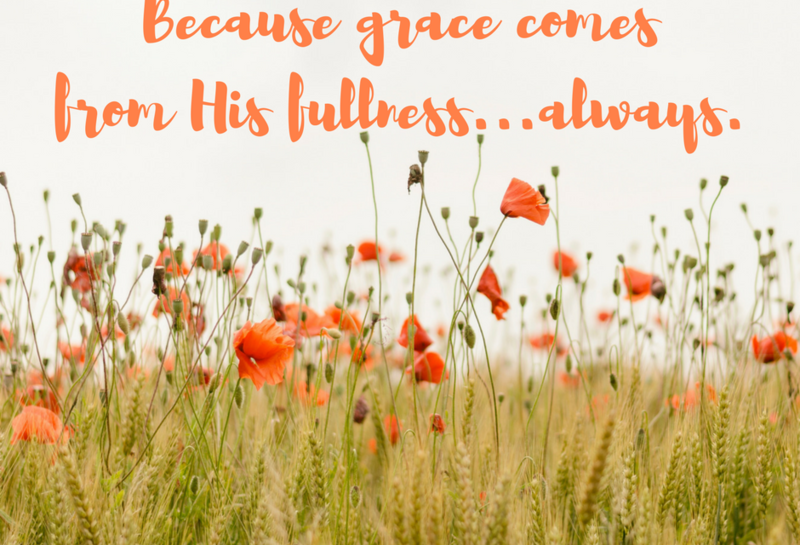 God’s fullness is grace upon grace. And it is poured out over you. It is the antidote of hope against the less than which breaks our spirit. And the full work of grace is not just a promise but a declaration. I return to this prophet who cried aloud so often. This book resonates soul deep for me. Isaiah was charged with the job of casting truth to an undisciplined lot, to remind them who God REALLY is and how we ought to see Him, approach Him, love Him. I feel like an audience who should hear that sermon. Because so many times I feel like I am an undisciplined truth-seeking emptied out vessel hungry for a morsel but dieting on the scraps that are cast about. God’s Word is our food and our provision, yet how many times do I stop and savor it as I ought? In this 58th chapter, we are inspired to loosen the bonds that wickedness creates; to loosen yokes that enslave and hold in; to loosen the oppression that keeps us broken together. But what if we let our brokenness be the gift it should be? What if we are gut honest raw with one another in a way that lets grace flood and mercy meet and kindness heal? What if we recognize that we can exchange what is ours, broken and not enough, for what is His, the fullness of more than? What if in our wandering through the wilderness we find ourselves resting wholly in the fullness of grace? Then our status would change. And because of His fullness we can pour out grace on the less than and cover the exposed with mercy and be present in kindness with the ones that break us. When His fullness is extended light arrives, power is released, healing comes, and glory covers. Here’s the truth of the matter… this grace upon grace thing… it comes from the fullness of God. It is layered from Generations to Revelations, it is a starting salutation and an ending prayer. 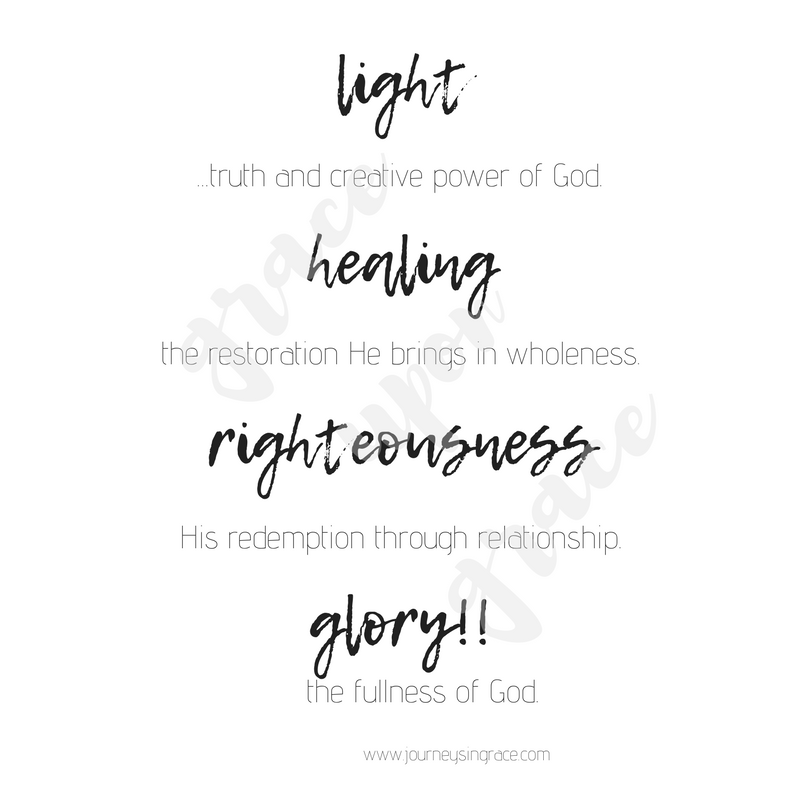 It is His hope catalyst of creative power (light), restoration and wholeness (healing), redemption and relationship (righteousness) and the fullness of God (glory) merged together. I’ve been reading a lot lately, about people and purpose and mercy and love. And I have been wading deeply into His Word but even more so in prayer. I’ve been living off the crumbs instead of the fullness because I been too busy to pause and get full. Yet, we need to be filled up in the fullness of His grace. We need to operate from mercy to mercy and with overflowing favor to one another, on purpose. 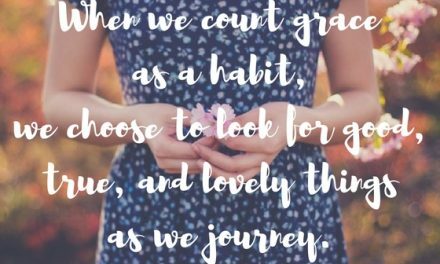 We need to let glory win and the love of God perfect us and the overflowing hope Romans 15:13 talks about becomes the abounding grace that leads us to live in the more than moments. 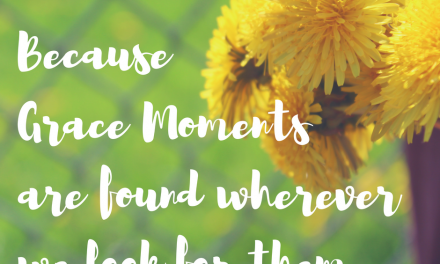 And I am taking a bit of a break here at the #GraceMoments Link up in the month of May because I need to be patient in the filling the Lord is calling me to rest in. The link up will be here but the posts will look a little differently. For the month of May and maybe into June, I will be showcasing one of YOU each Thursday and cheer you on. As I sit with your words, soaking up grace upon grace, I will share one or a few that really moved my heart and blessed me the following week. I love the idea of being encouragers and cheerleaders for grace together, so I hope you will keep showing up with your awesomeness. I am grateful for you. Praying for grace upon grace to be yours today. So good, Dawn, that you are taking a break for a few weeks. 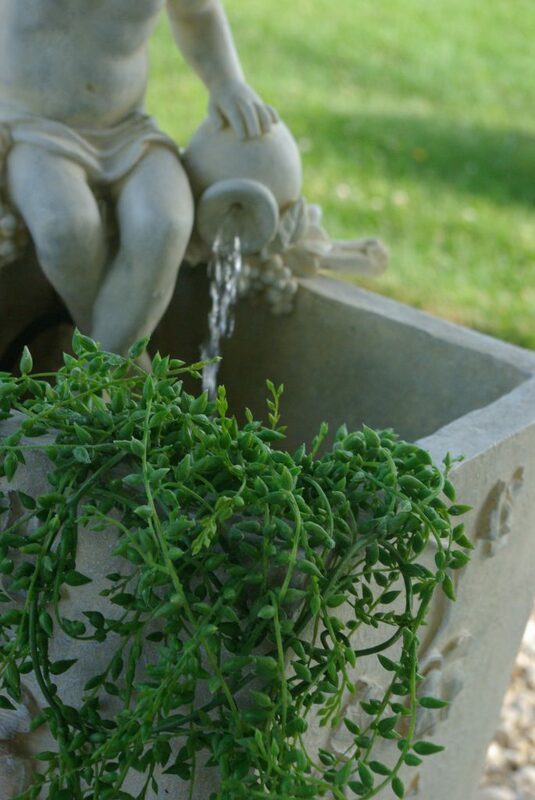 Sometimes we forget that it’s only God who can continually pour forth from an always full reservoir. Blessings to you as you take this time away from heavy writing responsibilities to let yourself be filled and renewed. 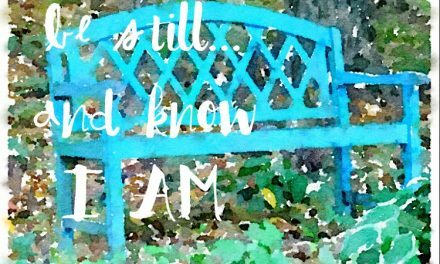 Have a good rest Dawn, “Be still & know that God is God” Ps 46:10 while you rest up! 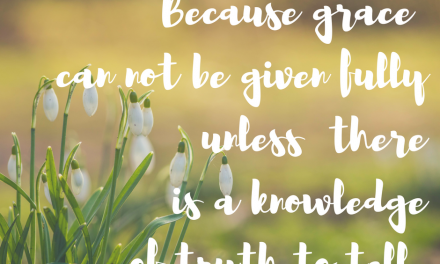 Grace & healing, healing & His grace…great post! Dawn, Hope your rest wonderful. The words you wrote keep running through my head. Grace upon Grace. I can’t wait to ponder those all daly.